Troy Eklund helped his Nevada Griffons to a June 1987 win with a dramatic eighth-inning tie-breaking home run, The Nevada Daily Mail wrote. "When I hit it, I was thinking double," Eklund told The Daily Mail afterward. "I was running and watching, and it started rising. When it started rising, I knew it was gone. It kind of surprised me." Eklund played that summer in Nevada in between his time at the University of Arkansas. He went on from there to a brief career as a pro, and then to a career in broadcasting. Eklund's career in baseball began in 1989, taken by the Rangers in the 25th round out of Arkansas. With the collegiate league Griffons, Eklund hit 17 home runs by the end of July. Earlier that July, Eklund was credited with taking a home run away with a catch. Eklund returned to Arkansas that fall. In 1989, Eklund knocked 12 triples and won All-American honors. 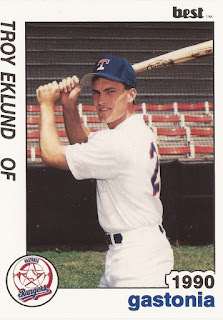 Over his career there, Eklund knocked in 180 runs. He also helped his club to the 1989 College World Series. Eklund hit a two-run home run in an Omaha loss. With the Rangers, Eklund played his first season between rookie Butte and single-A Gastonia. Between the two levels he hit .206, with just two home runs. He returned to Gastonia for 1990. In 98 games, he hit .236. He also hit six home runs and had 32 RBI. Two of those RBI came in a July 1990 game, sealing an extra-inning win. Eklund has since gone into broadcasting, working with Cox Sports.